Read the critically acclaimed New York Times best-seller with more than one million copies in print. Same Kind of Different as Me was a major motion picture release by Paramount in fall 2017. Meet Denver, raised under plantation-style slavery in Louisiana until he escaped the "Man" - in the 1960's - by hopping a train. Non-trusting, uneducated, and violent, he spent another 18 years on the streets of Dallas and Fort Worth. And the woman who changed their lives -- Miss Debbie: "The skinniest, nosiest, pushiest, woman I ever met, black or white." She helped the homeless and gave of herself to all of "God's People," and had a way of knowing how to listen and helping others talk and be found - until cancer strikes. 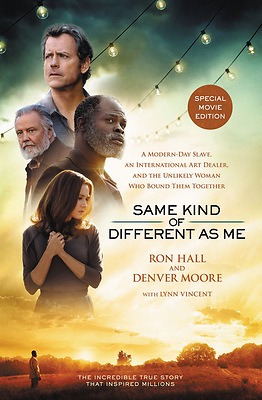 Same Kind of Different as Me is a tale told in two unique voices - Ron Hall & Denver Moore - weaving two completely different life experiences into one common journey where both men learn "whether we is rich or poor or something in between this earth ain't no final restin' place. So in a way, we is all homeless-just workin' our way toward home."